If you have light-colored carpet, you may have experienced dark lines that appear on the carpet. This soiling is called filtration soiling because it comes from air passing through the carpet as it is attempting to get through the crack between the carpet and the baseboard. As the air passes through the edge of the carpet pile, microscopic soiling is deposited there (hence the term filtration soiling). This occurs over a significant period of time and is not noticed until a buildup has occurred. This type of soiling is difficult to remove because the soil particles are so fine that they penetrate deep into the carpet pile, even sometimes into the backing of the carpet. Can filtration spoiling be removed? Sometimes. With special products, time, and effort, reasonable results can be achieved. To help prevent filtration soiling, vacuum and wipe the edge of the carpeting on a regular basis. Be careful around the tack-strip on the edge of the carpeting; it could nick your fingers! Jute, sisal, sea grass, coir and hemp are names associated with floor coverings made form raw plant materials. Ranging from mats to wall-to-wall, some with backings, some without, this type of material is in a very raw state. Therefore, an understanding of how the fibers react to everyday soiling and how they respond to cleaning is helpful. One of the unique characteristics of this type of floor-covering material is the tendency to develop mysterious dark spots when cleaned, regardless of the method used. Generally, efforts to bring a “worn” sisal back to its original state are a lost cause. Also, sisal stains very easily. One of the best things to do is have a protected with a solvent-based fabric protecter, providing some resistance against spots that result from any type of spillage. In addition to developing dark spots, sisal may also “lighten” when cleaned. The best way to clean plant materials is with a low-moisture approach. The bottom line is that these products are not very spillage, traffic or cleaning friendly. However, you can’t beat the look. Place this type of floor coverings in non-traffic, non-spillage areas to prevent over use. Have a light, maintenance cleaning done about once a year to remove surface soils, pollen, asphalt, exhaust, and other foreign matter that finds its way into our homes. A final note about sisal: some wool carpets come in a “sisal style.” These products are made to look like sisal, but are actually an entirely different material. What Carpet Fiber Should I Choose? In asking that question, one must consider the clean-ability of that particular carpet. Even though the construction of the carpet plays a significant role in the life of the carpet, the fiber type is extremely important. Before getting into this report, let it be made clear that this advice is NOT to override the recommendations of your carpet retailer. This report simply states some of the characteristics of three fiber types commonly used in carpeting, in order to provide an understanding of how fiber plays a role in soiling and particularly in wear. There are many fiber types used in carpet manufacturing; however, for the purpose of this article we will focus on the three main players. Olefin has become extremely popular in recent years. The first attraction to olefin is the price. Olefin is generally-although not always- less expensive than other fibers. The second appeal is that this fiber will not absorb any liquid. If you were to take a yarn from an olefin carpet and place it in a glass of water the fiber would float on the top of the water. Nylon and wool would not, since each would absorb a certain amount of water. The point is this: when something is spilled on olefin carpet, it will not be absorbed into the fiber. The value is that permanent staining from spillage is reduced. In addition, olefin carpets are solution dyed, which means that the color is introduced into the molten plastic before the fiber is made. The characteristic of being non-absorbent can present unique cleaning challenges. Sometimes when spillage occurs, it runs down the side of the yarn into the backing of the carpeting. Many times this can cause wicking problems as the spill gets trapped in the backing of the carpet and is not effectively removed. Therefore, it continues to wick up the surface over time. In addition, if an inexperienced carpet cleaner leaves too much liquid in the carpet after cleaning, it simply slides down to the backing of the carpet with the soils, and as the carpet dries, it wicks back to the surface. The second challenge with olefin is a characteristic that is often over-looked: Olefin fibers are less resilient than others. What that means in plain and simple terms is that when a fiber is crushed, it doesn’t “bounce back” as well as other fibers. It also “scratches” very easily. A very common occurrence with olefin installations is the traffic areas begin to look dingy or worn. In fact what has happened is the fibers have been scratched from foot traffic. Imagine a plastic toy that has a scratch on it: there is nothing you can do to remove that scratch. It’s permanent. The same is true of an olefin fiber-once it is scratched, nothing can be done to correct it. In high traffic area, the carpet may appear completely different then the edges against the wall. The third interesting characteristic of olefin is that it is an “oil-loving” fiber. In other words, in the same way that is repels water-based soils, it absorbs and accepts oil-based soils, making it difficult to remove common oil-based soils in a household, such as lamp oil, lotion, body oils, and cooking oils. This can be especially important to keep in mind when choosing covering for floors just outside a kitchen area. Some of the higher-quality carpet mills “scour” the olefin to attempt to reduce the oil-attracting properties. Our company uses special cleaning agents manufactured for effectively cleaning olefin carpets. Nylon has definitely been the most widely used fiber in the residential environment, and for a good reason. Nylon is very resilient, has good dry soil resistance, and doesn’t present as many cleaning challenges. Nylon is also very resistant to spillage. Since most residential nylon is not solution dyed, but dyed after the carpet is made, it is not impossible to stain; however, if the spot is attended to in a timely manner, one can expect excellent spot removal results. Residential nylon carpets are also treated with a fluorochemical such as 3M Scotchgard or DuPont Teflon which helps tremendously with dry soil resistance and stain resistance. According to a Consumer Reports article in the August 1998 issue, branded nylons performed better than non-branded ones. Wool is more resistant to foot traffic than any other fiber. This is the reason that you see Oriental rugs that have lasted for so many generations. Wool hides dry soil naturally and is not adversely affected by it for quite some time. Another wonderful aspect of wool is that it is a great insulator. In the winter your home will be warmer inside and in the summer it will be cooler. However, the cheaper wool stains easily and may not be the choice where children and pets are present. Cover spill with a WHITE napkin or paper towels. DO NOT use colored paper! It might transfer onto the carpet. Be sure to use a THICK stack to absorb as much of the spot as possible. Blot by stepping on the stack of towels. REPEAT THIS PROCESS UNTIL NO TRANSFER TAKES PLACE. Do not rub!! Apply spotting agent. Warning: Do not use over-the-counter spot removers! They can leave a sticky residue that attracts soil and may discolor your textiles. Instead, call us to find out what spotters we recommend. REPEAT steps 1 and 2. If the spot does not come out, do NOT attempt any further action, as you may set the spot and/or damage your textiles. Instead, give us a call. Do not over-wet the spot. Keep blotting until dry to the touch. Why Spots Return After Your Cleaning? Have you ever wondered why spots return after having your carpet cleaned? There are two reasons why spots return. Many times, the spot that is being removed has seeped into the backing of the carpet. This is common with pet urine, beverages, and anything spilled in “volume.” The material dries in the backing and in the cushion (pad) of the carpet. When the spot is cleaned, only the material in the “pile” of the carpet is removed. However, moisture is introduced into the backing of the carpet. As the spot dries, the material in the backing of the carpet “wicks” back into the pile of the carpet much like wax into a candlewick. Even traffic area soil that is embedded can wick back. This is especially common in glued-down carpet that is heavily impacted with soil. When the carpet is cleaned, it looks good. When it dries, the spots and traffic area soil come back. The good news is if a spot actually wicks back, it can be removed. When you spot clean, place a folded white terry cloth towel over the spot just after you clean it while the spot is still moist. Place a heavy object on top of the cloth. Be sure to use a non-porous object that won’t transfer color onto the carpet. For example, a paper book cover could transfer color. Use a brick, a planting pot, or something like that. When you have our carpet cleaned professionally, be sure to point out spots that have wicked back in the past so they can be treated properly. Resoiling is caused by a sticky residue that has been left behind. The residue may be from the spot itself, the cleaner that was used, or both. Some common residue causes are over-the-counter carpet cleaners purchased at the grocery store. Avoid using these cleaners altogether. If you have to use one of these cleaners or you have to use dishwashing detergent, use as little as possible and rinse with water thoroughly. Other residue causes are oily spots, duct tapes body oils, lotions, and other sticky or oily substances. If the entire oily residue is not removed, it will attract soil as the carpet is walked on. Even quality professional cleaning may not remove all oily residues the first time. Copies of specific warranties from your carpet purchase may be available from your carpet retailer. Stain resist warranties can vary from 5 to 20 years. 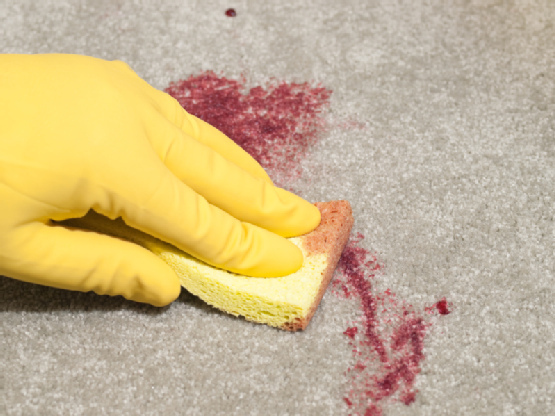 ALL STAIN RESIST WARRANTIES REQUIRE REGULAR CLEANING AND IMMEDIATE SPOT REMOVAL. It is said that the three most important rules for maintaining carpet are vacuum, vacuum, vacuum. Vacuuming your carpet often; once or twice a week at least. Vacuuming removes the sharp soil that cut and slices the fiber, causing premature wear. Much of this soil is not visible to the eye. Remove any loose particles such as food, leaves, pieces of crayon, and bugs, as these items can cause a spot on the carpet. Be sure to use a quality vacuum cleaner that is well maintained. If you have any questions about what type of vacuum is best, please ask us. Most people don’t clean their carpet often enough, perhaps due to the cost or the hassle factor, or because they do not realize how important regular professional cleaning can be. For example, if your traffic areas are visibly soiled, you have already waited too long! Traffic area soil is somewhat oily and bonds to the carpet fibers, eventually staining the carpet. Once this has taken place, even though professional cleaning will make it look much better, the traffic pattern will still be visible. In addition, traffic area soil is sharp- like sandpaper- and it abrades the carpet fibers. To keep this to a minimum, clean your traffic areas before they look visibly soiled. As a general rule, professional cleaning by a professional certified firm should be done about once per year. For extremely heavy traffic areas, cleaning may be required more often. Proper professional cleaning will not leave a sticky residue behind and can be done as many times per year as needed. MANY STAIN RESIST WARRANTIES REQUIRE PROFESSIONAL CLEANING EVERY TWO YEARS. Professional cleaning removes the damaging soil that vacuuming has not been able to remove from the traffic areas. Spots that are not immediately removed can turn into permanent stains very easily. When a carpet is new or has sufficient protector on it, plain tap water will remove many spots. However, for those spots you can’t remove easily with water, you must use a spot cleaner. Select a spot cleaner recommended by the carpet manufacturer or by your trained, certified professional cleaner. Most spot removers purchased over the counter leave too much soap residue and can cause yellowing. Avoid using foam carpet cleaners or any product not made specifically for carpet. Apply spot cleaner sparingly to white terry cloth and gently massage the spot, causing it to transfer onto the cloth. Never pour spot cleaner directly on carpet. If the product you are using seems to cause the spot to re-soil over a few-week period, discontinue use. For any spot that you are not able to remove, and for pet urine or feces, call your professional cleaner immediately. Residential nylon stain resistant carpets are treated with stain resist properties and soil resistors known as Dupont, Teflon or 3M Scotchgard. After a period of two or three years, some of the soil resistor wears off. At that point, you should consider having a professional carpet cleaner reapply the protector after the professional cleaning. The soil resistor will help soil slide off the carpet more easily when vacuuming, spots will be easier to remove, and professional cleaning will be more effective. Unprotected carpet soils faster, doesn’t last as long, and is prone to permanent staining. How Do I Best Care for My Carpet? These widely used comments have stemmed from unfortunate encounters with uninformed cleaners who have left the carpet with an overload of detergent residue. The unfortunate consumer has assumed this will happen with all carpet cleaning and resolved to wait until the carpet is in dire straits before cleaning it. The good news is that properly cleaned carpet will not re-soil quickly and will actually last longer. Why? Because damaging soils are removed with effective carpet cleaning. Soil that is not removed by vacuuming, even though it can rarely be seen by the naked eye, cuts and slices the carpet fibers as the carpet is walked on, breaking down the carpet yarns in the traffic areas. The result is that even with restorative cleaning at that point it will not correct the damage that has been done to the fiber. Not to mention that a carpet that is not cleaned on a regular basis is an unhealthy carpet. Carpet is like a sink. It collects pollens, insecticides, exhaust, and other undesirable substances that get tracked in or blow in from the polluted outdoors. Carpet manufacturers state that a residential carpet should be professionally cleaned at least every 18 to 24 months for best performance. More often if pets and/or children are present and perhaps more often if you are a smoker. The EPA published a guide that suggested regular cleaning frequencies based on the number of occupants and other factors. In short, a carpet that is maintained on a regular basis will not only last longer but will also provide a healthier indoor environment. Your carpet represents a significant investment. Just like any investment, maintenance is required to get the best return on it. Think about your automobile. You change the oil in your vehicle so the engine will last longer, to avoid costly repairs, and to get top performance from it. The same is true for your carpet, or any floor covering for that matter. By properly maintaining your carpet it will look better, last longer, and contribute to a healthier indoor environment. Every day “environmental oils” attract abrasive soils. Carpeted traffic areas coming from the kitchen collect cooking oils. Sofa arms collect body oils, and hard surface floors collect film from cleaning agents. The grit then eats away at the surface like sandpaper. The solution is to have your carpets, upholstery, draperies, and hard surface floors cleaned at least every 12 months; more often in high traffic areas. You have probably heard that cleaning your carpets and floors too often is harmful. This is simply not true IF your floors and fabrics are cleaned according to proper standards. This myth came from uneducated, uninformed, and sometimes downright unscrupulous cleaners leaving a sticky residue behind, which made the attraction to harmful soils worse instead of better. Why Didn’t Carpet Protector Work? If you had carpet protector applied in the past, and it didn’t work, here is why. 1. Not using high-quality protector. Discount protectors are not as effective and sometimes void the warranty of the carpet. Use only the highest quality recommended protectors. 2. Not using a dedicated container. Using the same container for carpet protector and for cleaners can contaminate the carpet protector, making it gummy and ineffective. Our vans have a dedicated container reserved only for carpet protector. 3. Not applying the product properly. Some cleaners either under-apply or over-apply the protector. 4. Not grooming the carpet. For the best performance, the product should be groomed into the carpet for maximum penetration. This ensures contact with all surfaces of the carpet yarn and proper distribution and drying. Our company thoroughly grooms the protector into the carpet pile. What happens if I don’t apply carpet protector? A great-looking carpet can be ruined by an ugly spot. Unprotected carpet doesn’t repel spillage as well as protected carpet. Being able to remove spots and spills more effectively avoid permanent staining. Traffic area soil is very abrasive and cuts carpet yarns like a knife. This damaging soil can easily bond to an unprotected carpet. By applying protector, you will increase the life of your carpet dramatically. When you vacuum your protected carpet, the soils will release from the carpet pile much more effectively. The easier a spot is to remove, the less cleaner you will have to use, the less agitation you will have to use, and the less time it will take. With protected carpet, many spots can be removed easily with just water or the free spot remover we provide you with. 4. Next professional cleaning not effective. Because of the first three items in the list, not having protector can reduce the effectiveness of your next cleaning. Having protector applied to your carpet will enhance your next cleaning. More soil will be removed the next time your carpeting is professionally cleaned. Although you want to call us out to handle any spot you cannot remove immediately, carpet protector helps you remove more spots than you could without protector. You may be able to save a minimum charge by remove the spot yourself. Here’s the answer to the question of whether to have carpet protector applied: You should always get carpet protector on nylon or wool carpet. Olefin carpet can even benefit the abraded areas. So, make it your goal to always get carpet protector applied when having professional cleaning done. Should I Use a Carpet Protector? Unfortunately, there is a great deal of confusion about capret protectors in our industry. Untrianed and sometimes downright unscrupulous carpet cleaners give out false information, and in the worst cases, intentionally misrepresent the product. WARNING: The protector that was in your carpet may be gone, leaving you exposed! A nylon stain-resistant carpet is made with two protective properties: the first is an acid dye blocker that is basically a clear dye that fills the extra dye sites in a fiber, This helps to keep “foreign” dyes (such as red dye in a beverage) from penetrating the carpet fiber. The second property is called a fluorochemical. Two commonly used fluorochemicals are 3M Scotchgard™ or DuPont™ Teflon®. This treatment helps keep spillage from actually getting to the acid dye blocker, but its biggest job is to resist dry soil. By resisting dry soil, less soil bonds to the carpet, therefore more dry soil is picked up by your vacuum or cleaning. Making sure that you have a sufficient amount of protector on your carpet will help keep the soil from bonding to the carpet. Once it bonds to the carpet, it acts like sandpaper on your traffic area. Once the traffic area yarns are broken down, there is no way to bring them back to their original state. Over a period of six months to two years, depending on the traffic, a significant amount of carpet protector can be removed from your traffic areas and needs to be reapplied. Many cleaners use harsh chemicals on the carpet; those chemicals will strip your carpet’s factory protection. If you have had your carpet cleaned in the past, there is a good chance the cleaner removed a significant amount of protector. It needs to be reapplied. Should you go with dry cleaning vs. steam cleaning? Is one method better than the other? Are these even the right terms? Well, as usual, these terms only hint at part of the issue at hand. Both “dry” and “steam” are incomplete and inaccurate terms. Neither are technical terms that properly describe carpet cleaning methods. There are actually four methods of carpet cleaning approved by the lICRC, the world’s most recognized body of certification for carpet and upholstery cleaners. Otherwise known as “steam cleaning,” hot water extraction is the pro-probably familiar with. Hot water extraction is the process most people are familiar with. Hot water extraction is the correct technical term, not steam cleaning. Actual steam is not used at all. A hot water solution is produced and immediately recovered, creating a “flushing” action on the carpet. The smallest portable machine rented at the grocery store could be called a “steam cleaner,” but a powerful truck-mounted machine is obviously more capable of doing a thorough cleaning job. However, the biggest and most important difference is in the person cleaning the carpet. A trained technician will know what pressure to use, what cleaning products to use, and how to get maximum soil removal and maximum spot removal without over-wetting the carpet or leaving sticky residue behind. The horror stories of carpet being wet for days are due to operator error, not because “steam” or hot water extraction caused it. Hot water extraction applied properly will remove more soil than any other method. Further, anything that has seeped into the backing such as coffee, other beverages or urine can be “flushed out” with hot water extraction. This method can also be used in lightly soiled and maintenance situations as it is very versatile. Also known as bonnet cleaning, this method employs a round pad that spins across the surface of the carpet, absorbing the soil. A solution is applied to the carpet or the pad to aid in releasing soils. This is a method that some may classify “dry cleaning” although water-based products are used in almost all “dry cleaning” systems; therefore, the term dry cleaning is not technical and would not be desired. Absorbent pad cleaning is not a deep-cleaning method. It should only be used to clean lightly soiled carpet and upholstery. This method uses a powder that has been treated with detergents, water, and solvents. The powder compound is sprinkled on the carpet and a brush with cylindrical brushes is used to work the powder into the carpet pile. The solution in the powder releases the soil. The soil is then absorbed into the absorbent powder. This method should only be used to clean lightly soiled carpet and upholstery, and for maintenance cleaning. In this method, a shampoo or foam is generated and worked into the carpet with a rotary brush or cylindrical brush machine. The shampoo or foam releases the soil. The soil is then vacuumed with the machine or allowed to dry and removed with a conventional vacuum cleaner. When using shampoo, great care should be taken to avoid leaving a sticky residue on the carpet. This method should only be used to clean lightly soiled carpet and upholstery and for maintenance cleaning. Question 1: What kind of reputation do they have? We always want to get the best work at the best price. However, many companies offer poor quality work and a good price. So, how do you choose a good carpet cleaner with so many options? You’ll likely get the worst experience you ever imagined. Choose a “commodity” carpet cleaning company. This is typically a high-volume company that does a lot of mass media advertising. They may not be the lowest, but their prices are “competitive.” The problem is they don’t train their staff very well and they skip vital steps in the cleaning process; that ends up costing YOU in the long run. Choose a reputable, experienced, certified carpet cleaning firm. Choose a cleaning firm that measures up to the seven questions in this book. You will end up with a phenomenal cleaning job AND a pleasant service experience. The typical scenario with the first two types is to “bait” you with a low price, then “switch” you to their “dual scrub” or “deep clean” system. They proceed to soak your carpet and leave a soapy residue behind. Good luck getting them back again! If their price is truly low, you should be concerned about their quality. What are they leaving out? How can they pay their technicians a decent wage and have the best products and equipment at the lowest price? Many companies advertise a low price then charge you more when they get there. Be clear about what is included and what is not. These so-called “cleaning” companies also happen to be the ones that don’t educate themselves or their employees. The result is that carpets and fabrics are ruined every day by uneducated, uninformed, and sometimes downright unscrupulous carpet cleaners. They are facing soiling conditions they have never seen or heard of due to a lack of education. Or worse, they create a problem on a carpet or fabric, and they have no idea how to fix it. One example is they leave sticky residues in the carpet that cause the carpet or fabric to re-soil rapidly or to discolor. Top-notch education is readily available in our industry. There is no excuse for cleaners not to educate themselves (and provide a useful education to their clients). Part of the problem is that they have fallen into the trap of viewing cleaning as a commodity, and they can’t afford to educate themselves. Education is expensive, but ignorance can result in disaster on YOUR carpet! Our company invests a great deal in education. Not only do we spend thousands of dollars per year on education, we are heavily involved in our industry, which makes us well-connected with our industry leaders. This way, if a unique situation arises in the field, we have experts we a can call on thereby bringing the cutting edge of cleaning technology to you. Our industry provides courses in carpet cleaning, repair, fabric cleaning, marble and tile cleaning, area rug cleaning, customer service marketing, management, and other related courses. Many of the organizations offer certification programs that involve testing, and ethics requirements. There is a variety of opportunities to stay plugged into; trade publication, websites, bulletin boards, and more. We attend every course we can in order to bring you the very best. Many of these courses require travel across the U.S. and can, therefore, be quite costly. However, we believe, as fiber technology changes and as floor coverings become more complex, proper education becomes even more important. The bottom line is that you have a tremendous investment in your textiles and flooring systems and it is our duty to know how to best care for them. Understanding cleaning technology at the highest level helps to reduce cleaning residues and creates a healthier indoor environment by eliminating invisible germs and bacteria. It also empowers the cleaner to remove more soil, thereby creating a longer-lasting fabric or floor. A reputable consulting firm in the carpet cleaning industry undertook a “mystery shop” of three very visible companies in the carpet cleaning industry. The findings shocked even us! The first company that was called not only had horrible telephone manners but sent out the rudest, most unprofessional and uninformed crew you could imagine. They acted like they were being bothered the entire time they were there which was a total of 37 minutes! This crew did not pre-vacuum the carpet, didn’t pre-spot it and didn’t groom it. Even though the spots were not satisfactorily removed, the crew was unconcerned and unwilling to try harder. Their one-step method doesn’t even come close to meeting minimum standards of the Institute of Inspection Cleaning and Restoration Certification (IICRC). Because the crew just brushed over the carpet with the cleaning tool, the soils returned before the day was even over! At the end of the job, our consultant was required to sign a lengthy document even though the company couldn’t clearly state any reasonable guarantee. And the company had stressed their guarantee to secure the job over the telephone. To top it off, these idiots never said thank you. Not even a smile the entire time proved that a customer was just another bother in their day. How sad. The second company sounded more promising at first. Their telephone courtesies were somewhat better but not anywhere near what they should be. This company gave us a 2 p.m. to 5 p.m. arrival window. At one O’Clock, the consultant called to check on the arrival time. “Toward the latter,” he was told. At 4:10 p.m. he called again. “The crew is still at their previous job They should be about an hour. “Oh, so you took on more work on your previous job and bumped me huh?” the consultant replied. The so-called Operations Manager said, “It’s only 5:10!” insinuating they weren’t actually late. They couldn’t give a specific arrival time so our consultant canceled the job. If a company doesn’t care enough to communicate with the client, turn down extra work, and offer alternate arrangements for their clients, they don’t deserve the work, no matter how good they are. If you’re not there, you can’t very well do a good job, now, can you? The third company was better than the first two but was found to be very lacking for a company considered a “top” company. Booking the job was about as average as the other two. Incorrect information and ignorance ran throughout this experience. This company gave a two-hour window for arrival. They called the day before to confirm which was good. The morning of the appointment, they called to confirm the arrival time. Good. When the technician arrived, he was very nice. But due to his inexperience, that was not enough to get them more than a “C average.” He didn’t know anything about the carpet, although he claimed to have been around carpet for a long time. He was baffled and it was a basic nylon carpet! This technician pre-vacuumed the carpet, pre-sprayed the traffic area and rinsed. Upon completion, he requested a signature beside several cleaning steps that were not provided. When pressed, we got the tired, old “well I didn’t have it on the truck.’ Duh! Both companies that actually made it to the job site had cleaning steps on their work order that they were unwilling to do. One step was grooming the carpet. In both cases the step was on the ticket (put there by their operational system to make sure they do it). Both blew it off as unimportant. Obviously any company has their bad days or days when employees just don’t want to perform. The scary part about these three companies is that they are very visible companies in the market they serve. The inadequacies and poor attitudes were obviously routine. At our company, we are extremely passionate about raising the standard of our industry. We commit to being courteous, to do our very best to show up on time, to educate you, to inform you, and to give your carpet the absolutely most thorough cleaning we possibly can. If we ever fail you on that, we will not only express deep regret and concern but will insist on refunding your money if we can’t satisfy you.